It’s a beautiful day in the neighborhood! – Life! So do you remember that song from the Mr Roger’s show? It was definitely not a favorite show of mine. I preferred Sesame Street or Reading Rainbow. That aside here is the reason for the title of this post. Sometimes, I wonder what people who have never been to Japan imagine when I make a comment about my house, my church, the grocery store or my neighborhood. I decided to take you on a tour to see the things I see everyday. Now that seminary is over I have my favorite part of the day to myself. Seminary conditioned me to wake up at five and I am still doing it. Tokyo at 5:00am is a wonderful place to be. 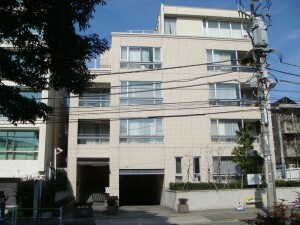 First, my house, well it isn’t exactly a house, it’s an apartment. I like where I live. I live on the third floor of this building. You will notice in the following pictures that Tokyo does not have underground utilities, thus the power lines in all the pictures. 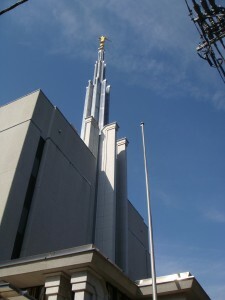 When I look out my living room window I can see the Angel Moroni on the Tokyo Temple. I like being able to walk to the temple in five minutes and I am blessed to be able to spend time there each week. This is an interesting view of the temple. One day while walking home from the station I looked up and saw this. 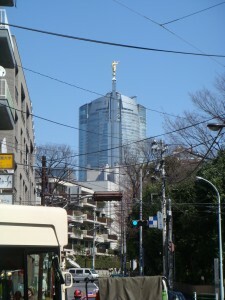 While standing on a certain corner, about two blocks from the temple, it appears that the Angel Moroni is part of Mori Tower in Roppongi Hills. We don’t have a car in Tokyo so we take public transportation when something is not in walking distance. This means we ride the metro, JR trains, buses, or take a taxi. My favorite is bus or taxi, but I actually use these the least. 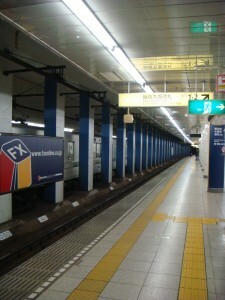 Here is a view of inside the train station. There are all kinds of shops nearby. 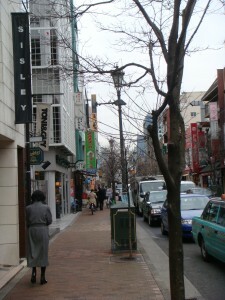 I can walk to a little shopping street just 7 minutes from my house. This is where my bank, drugstore, stationery shop, restaurants and chopstick shop are. There are several grocery stores nearby. 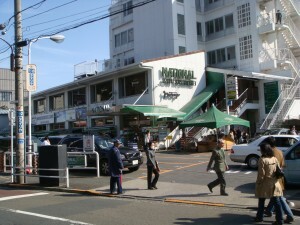 The one I go to the most is National Azabu. It caters to foreigners and has food from all over the world. They have excellent and expensive fish and produce. It is a tiny store with just 5 aisles. Most of the food in Japan is expensive. 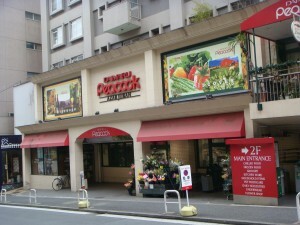 The other store I like is a Japanese grocery store about 15 minutes away in the other direction, Peacock. They have great store brands of instant miso soup and Japanese crackers. They also have a good selection of Japanese sweets. I bought the little pink pancakes wrapped in leaves here (see my Hina Matsuri post). The next pictures views on my street and the Tokyo Lawn Tennis Club just half a block away. 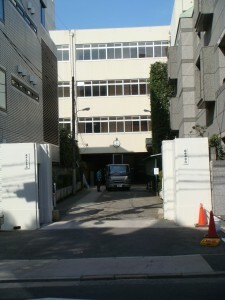 Tucked back in off the main street just two doors down is Azabu High School. 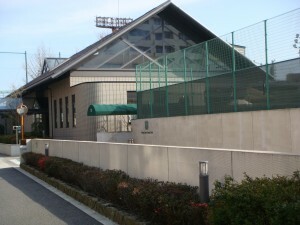 This high school is the top all boys high school in Tokyo. 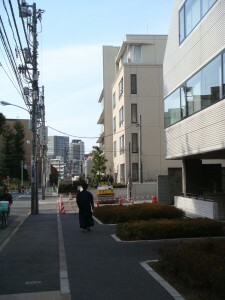 Boys attending this school have uniforms-black neru collar jacket with gold buttons and black slacks. It is rare to see them wear them unless something special is happening. On a daily basis they wear jeans and t-shirts. All of the students pass by our building several times each day as they go between the school and the metro station and the convenience store on the corner. Just 2 minutes from my house there is a beautiful park. It is a very natural setting and there is a small lake, a waterfall, trails for walking and many benches for sitting, people watching or pondering. 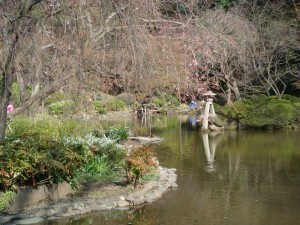 It is one of my favorite places in Tokyo. I love watching the seasons change here. I will continue to post views of my neighborhood and possibly the inside of my apartment. There are many interesting things to see in Japan. Luckily I have been to Tokyo 3 times now, so when you talk about little outings and excursions, I know what you are talking about and where places are. Your little tour was fun though, I have thought about doing a photo tour of my daily life in Boston several times, since not many make it a priority to come and visit me!!! But you are not one of them Mom, and I am so glad you are coming to see me…in 3 days!!! Thanks for the tour! You are very lucky to have a temple in your area. It was fun to see Allison in London in May while I was visiting.